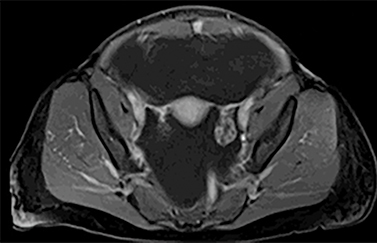 A 43-year-old previously healthy female presented to her primary care physician with a two-week history of 10-lb weight gain, increased abdominal girth, abdominal pain and fatigue. Her past medical history was largely unremarkable. Of note, she had lived in Arizona for three years. She was admitted to expedite her workup, and a bedside ultrasound revealed large-volume ascites. Aspirated ascitic fluid did not yield malignant cells, and cultures were negative for mycobacterial, acid-fast bacilli, or aerobic and anaerobic bacteria. 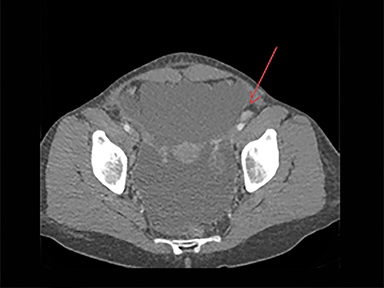 A CT of the abdomen and pelvis was performed; an MRI of the chest, abdomen and pelvis was prompted due to the CT findings. 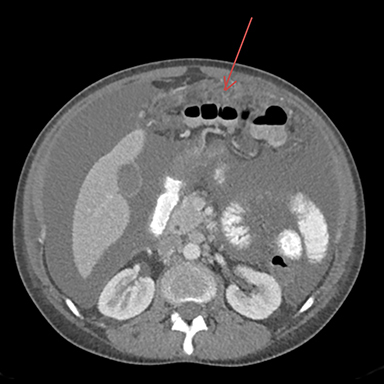 The CT of the abdomen and pelvis showed large-volume ascites with omental caking, as well as epicardial, and common iliac lymphadenopathy. No adnexal mass was identified. These findings resembled widespread metastatic disease without known primary (Figures 1-3). 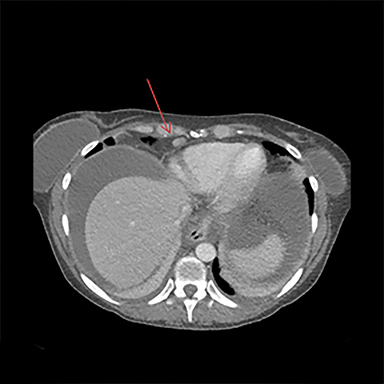 The MRI of chest, abdomen, and pelvis again demonstrated lymphadenopathy, including enlarged hilar lymph nodes, large volume abdominal ascites, omental caking and multiple enhancing nodules along the peritoneal lining (Figure 4). Additionally, it revealed an enhancing nodule within the rectus muscle (Figure 5). No adnexal mass was identified. Endobronchial ultrasound guided biopsy of the hilar nodes was negative for malignant cells, no granulomatous disease was identified. An inguinal lymph node and omental nodule biopsy were then performed by interventional radiology. 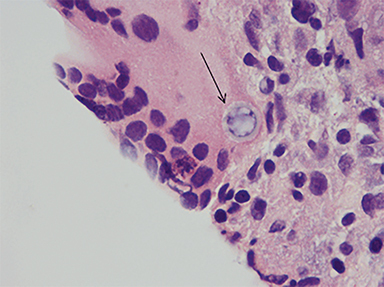 Histopathologic analyses demonstrated necrotizing granulomatous reaction, rare spherules and multinucleated giant cells (Figures 6-8). Disseminated coccidioides infection. Differential diagnosis includes widespread metastatic disease, lung primary was considered due to hilar lymphadenopathy; primary peritoneal carcinomatosis; tuberculosis; and atypical or fungal infection, such as coccidioidomycosis (in endemic areas). New onset ascites, lymphadenopathy, omental caking, and peritoneal nodules typically point to metastatic carcinomatosis. However, in endemic areas, coccidioidomycosis also should be considered as a potential diagnosis. In our case, the lack of primary mass despite thorough investigation, the soft tissue nodules within the rectus muscle, and disseminated yet sparse lymphadenopathy did suggest an atypical or fungal infectious etiology, in addition to malignancy. Coccidioidomycosis mimicking lung cancer in the form of pulmonary nodules and mass has been described extensively in the literature. CNS manifestations are also encountered in our medical center. 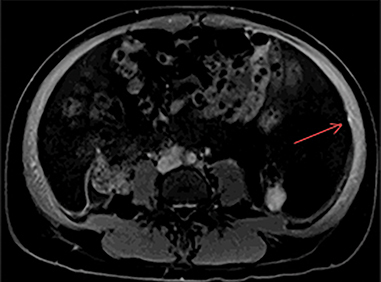 This particular case of peritoneal presentation highlights coccidioidomycosis’s diverse clinical and radiographical presentations. Our patient was started on a fluconazole regimen. Upon clinical follow up approximately 1 year later, she demonstrates no clinical signs of ascites and has returned to work. She will continue on the anti-fungal regimen for 2 more years. CDC. Increase in reported Coccidioidomycosis – United States, 1998-2012. MMWR. 2013;62(12):217-221. CDC. Valley fever (Coccidioidomycosis) statistics: Fungal diseases. Centers for Disease Control and Prevention. 2015;http://www.cdc.gov/fungal/diseases/coccidioidomycosis/statistics.html. Valdivia L, Nix D, Wright M, Lindberg E, Fagan T, Lieberman D, et al. Coccidioidomycosis as a common cause of community-acquired pneumonia. Emerg Infect Dis. 2006;12(6):958-62. Saubolle MA, McKellar PP, Sussland D. Epidemiologic, clinical, and diagnostic aspects of coccidioidomycosis. J Clin Microbiol. 2007;45:26. Desai NR, McGoey R, Troxclair D, Simeone F, Palomino J. Coccidioidomycosis in nonendemic area: Case series and review of literature. J La State Med Soc. 2010;162:97-103. Capone D, Marchiori E, Wanke B et al. Acute pulmonary Coccidioidomycosis: CT findings in 15 patients. Br J Radiol. 2008;81:721-724. Dues Filho A. Chapter 2: Coccidioidomycosis. J Bras Pneumol. 2009;35: 920-930. Crum NF, Lederman ER, Stafford CM, Parrish JS, Wallace MR. Coccidioidomycosis: A descriptive survey of a reemerging disease. Clinical characteristics and current controversies. Medicine. 2004;83:149-175. Galgiani JN, Ampel NM, Blair JE, et al. 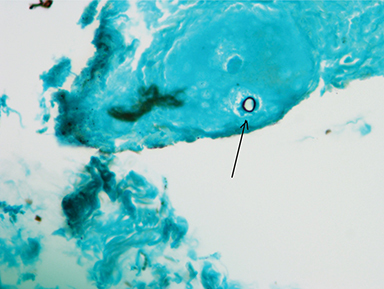 Coccidioidomycosis. Clin Infect Dis. 2005;41:1217-1223. 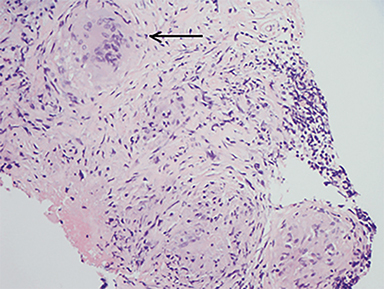 Devis P, Jindal R, Hur S, Eldersveld J. Coccidioidomycosis mimicking peritoneal carcinomatosis. Appl Radiol. 2017;46(4):28-29. Prepared by Dr. Devis while serving as Assistant Professor of Diagnostic and Vascular and Interventional Radiology in the Department of Medical Imaging at Banner University Medical Center, Tucson, AZ; Dr. Jindal while an MD candidate class of 2016 at the University of Arizona College of Medicine, Tucson, AZ; Dr. Hur while a Radiology Resident in the Department of Medical Imaging; and Dr. Eldersveld while a Pathology Resident in the Department of Pathology at Banner University Medical Center, Tucson, AZ.